Every framework that you come across has different ways of explaining the stacking or layering nature of Architecture, up to the point that you may think is there another way of looking at architecture. Archimate (although being part of The Open Group) suggests there are three layers, namely Business, Data, and Technology. The Open Group’s Architecture Framework suggests there are four layers, namely Business, Data/Information, Application, and Technology. If we look at the Zachman framework 2, we’ll find five layers, or six, or sometimes maybe more, or maybe less, depending on interpretation. Zachman considers layers somewhat differently from those in Archimate and TOGAF. Zachman layers are somewhat perspectives than layers but provide the correct dissection of Architecture to develop fidelity as we move deeper and/or horizontal. Layers do not mean that Architecture is developed independent of each other and have nothing in common. The layers must be seen as filters on the overall architecture. The architecture that provides enough fidelity and lineage for developing a business suitable system. Layers are filters for the overall view of architecture, kind of a grouping of like artifacts to support the entire architecture for the focused view. Most of the Enterprise Architecture Frameworks are IT-centric, they are evolving to add more business focus for alignment to strategy. 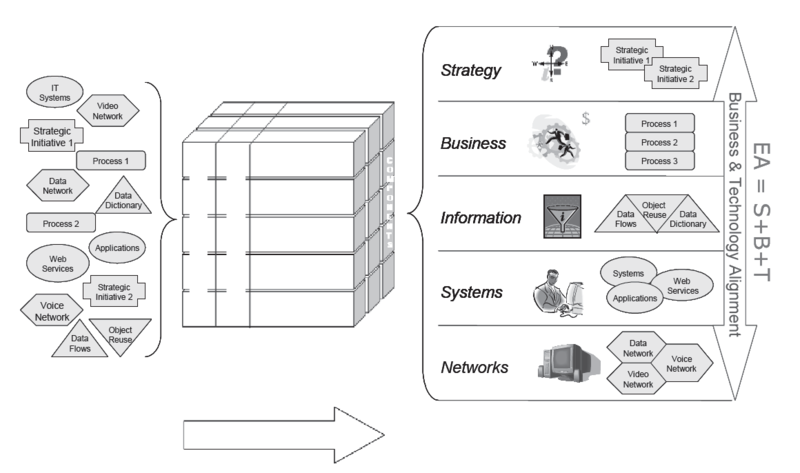 The architecture layers as mentioned above can be applicable to each business segment. A segment architecture is somewhat similar, but usually focuses one or more particular business units or functions – such as the finance and accounting group, or how a financial ERP system and all of its modules are going to be implemented (general ledger, accounts payable, accounts receivable, payroll, benefits, etc.). The entire industry is moving to B-DAT model for Enterprise Stack. In the move, suddenly I am looking at several different EA frameworks that explain how to organize and use the Enterprise Information Technology Stack. Not sure when we lost track of important aspects of architecture namely Integration and Security. Remember, integration of systems was the most important thing, that gave rise to Enterprise Application Integration patterns, that included Enteprise Service Bus as well. Then the most important Security, what happened to security architecture as well? Some frameworks still include that in their architecture, but they are mainly perceived as “Cross Domain Perspectives”. They are involved in all layers of architecture. The Strategies must be integrated, and so are the technologies. Application, data, and technology all must be secure. The layers may rely on one another for providing those integrations and security needs. You can find some frameworks include the integration and security within but most of the times these are complementary, and supporting to main architecture process and stack.